We had a nice article in the Pueblo Chieftain about how the museum was featured in a fan-film of "Ghostbusters". Click below to see the article. We just received these home movies taken by Pueblo firefighter Joseph C. Talbott in the 1950's. Talbott retired as an Assistant Chief from the Pueblo Fire Dept. in the 1960's. These were donated by Patricia Talbott-Crump to us a few weeks ago and we are very humbled that she gave us the originals. Hope you enjoy them. We recently received an original photograph from 1914, donated by Sandra LaMaster and the Pueblo County Historical Society. This picture is our second motorized fire truck and is sitting in front of the old Bessemer City Hall at Evans & Mesa. This is the first time we have seen this photograph, so we were quite thrilled to receive it. This fire mark was donated to the museum in Nov. of 2014. Found in the 300 blk. of E. Corona Ave., it has the name "Nichola Martella" engraved on the front, and on the back is "Mfd. by The GOBATTI Mfg. Co. - 603 W 4th Pueblo, Colo.". We will be doing more research on this and will update the website if we find anything. This is the steam gauge from our 1889 Ahrens Steam Engine. This artifact came to us from the Maloney family. 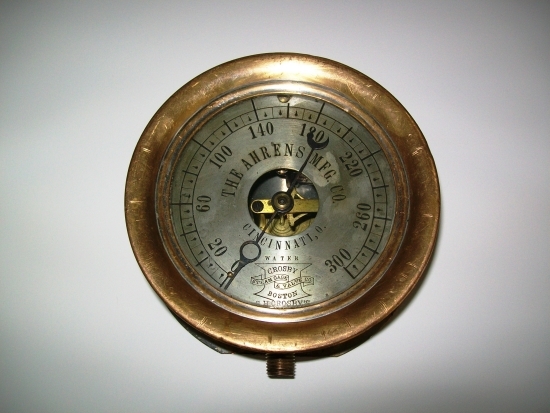 Further research showed that Ahrens Manufacturing Co. became its better known Ahrens-Fox Manufacturing Co. in 1891, so that substantiated the date of the gauge. There is a patent date of 1873 in the guage face. 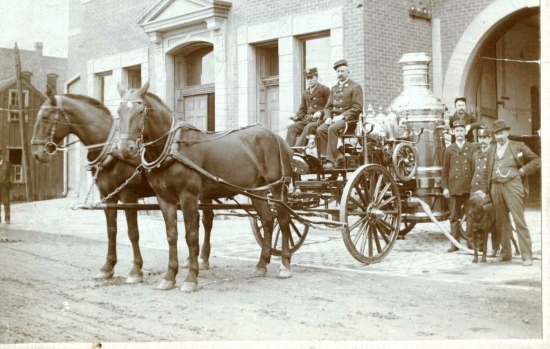 The Ahrens Steamer was the original Engine 1, and ran out of the Pueblo City Hall station at 135 Central Main Street. 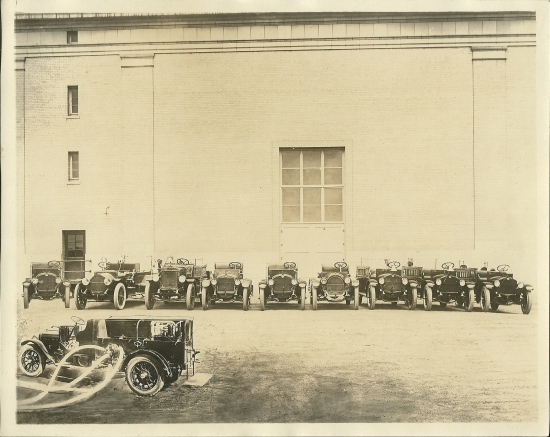 It was in service until 1921 or so and would be pulled by a motorized truck for the last 6 or 7 years of service. This blueprint for the Pueblo Fire Dept. from Mack Trucks was donated to the museum by firefighter Kehlen Kirby. Below is the close-up of the blueprint, and you can see Engine 4 written on the door of the truck. This Captain's badge from the Pueblo Fire Dept. was probably from the 1930's or 1940's, and was aquired on Ebay from someone back east. This leather helmet from the C. F. & I. Fire Dept. (Colorado Fuel and Iron) here in Pueblo. The C. F. & I. had their own fire department (still do as a matter of fact, though they are now Rocky Mountain Steel) and this Captain's helmet is most likely from after WW II. These decorative fire extinguishers from the 1950's were turned upside down and shaken to make them discharge. How times have changed from trying to hide the fire extinguishers to now having them painted red and signs showing where they are. Although not in the possession of the museum, we were given the chance to photograph this pin, belonging to a descendant of S. C. Bailey, member of the Corkish Hose Co. The pin is less than 2" in height. See the Volunteer page to read more on the Corkish Hose Co. This is a picture of Morris (Moritz) Lehman. 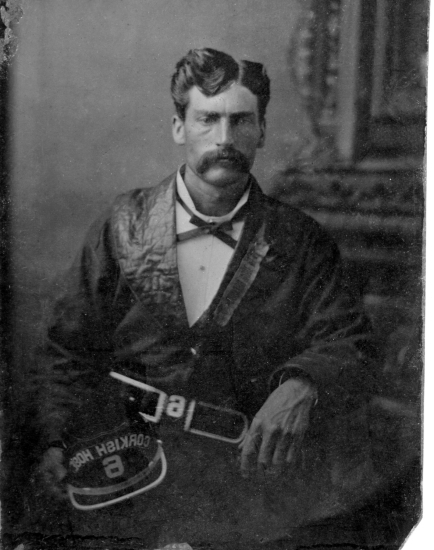 He was a volunteer fireman for years, and the second-to-last Fire Chief of the Volunteer Pueblo Fire Dept. 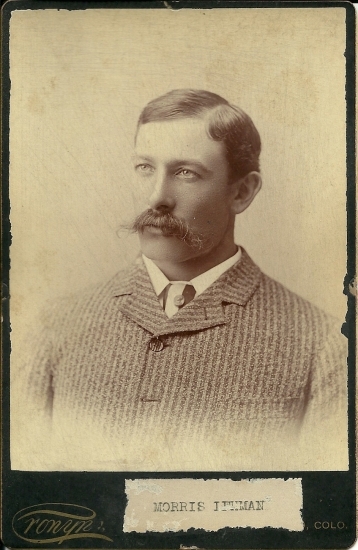 in 1886 and 1887. I looked for a picture of him 10 years ago and couldn't find one at the library. About 7 years ago, the Pueblo Chieftain wrote an article on Lehman and his descendants but had no picture of him. So when I recently came across this picture, I was quite excited to see the name. 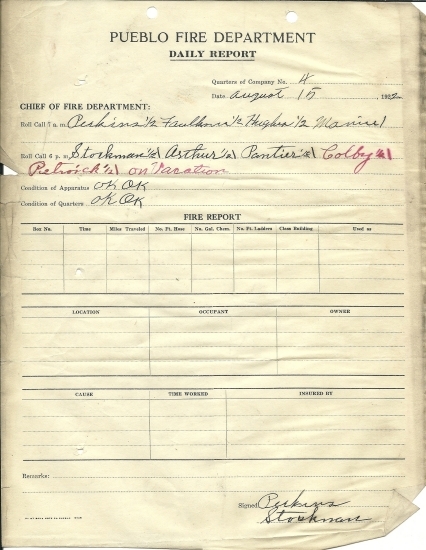 A daily report from August 15,1922 for Engine Co. 4. The Christy Pumper, designed by Pueblo Fire Chief Sam Christy and built by the Pueblo City Shops. 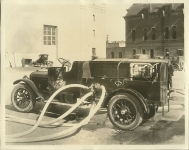 Christy never patented any of his designed and was featured in many engineering magazines in the 1920's with him explaining how to make the inexpensive pumper truck. These were featured in an advertisement for DeLaval Pumps (the ad is farther below). 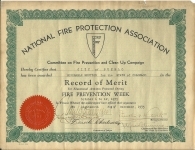 NFPA Certificates for 1935 (above left) and 1956 (above right). 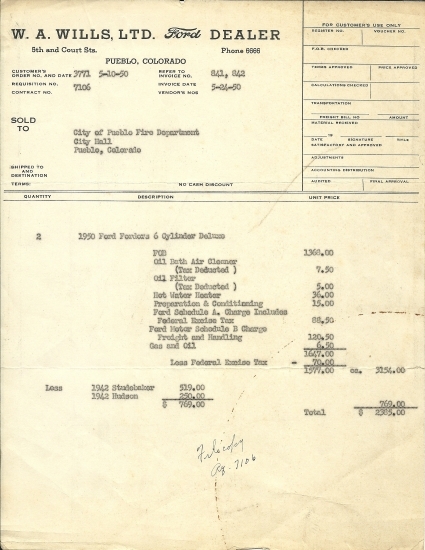 A letter from the local Ford dealership to the fire department, dated 5-24-50. (left) An envelope from the De Laval Company with a post mark of 1922 on it. 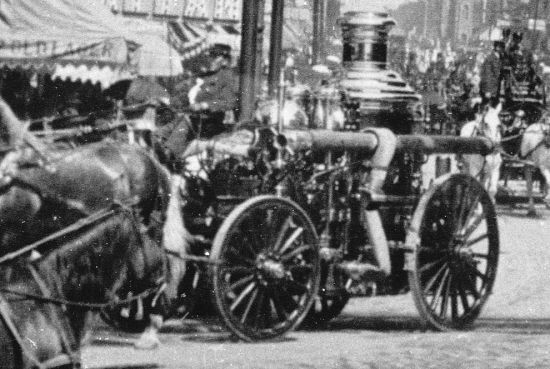 (right) A close up of the Christy Pumper. 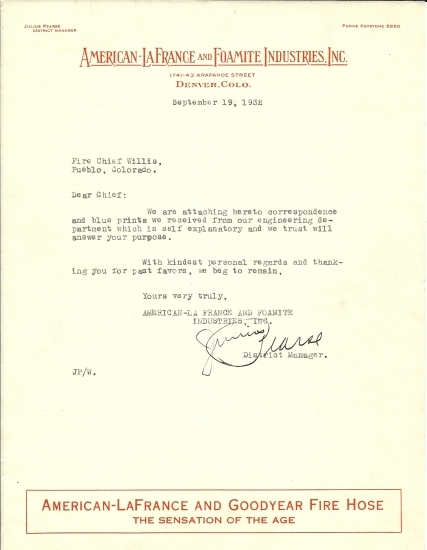 A letter from American LaFrance dated Sept. 19, 1932. We received this photograph in Dec. 2012. This unidentified person was with the Corkish Hose Co. No. 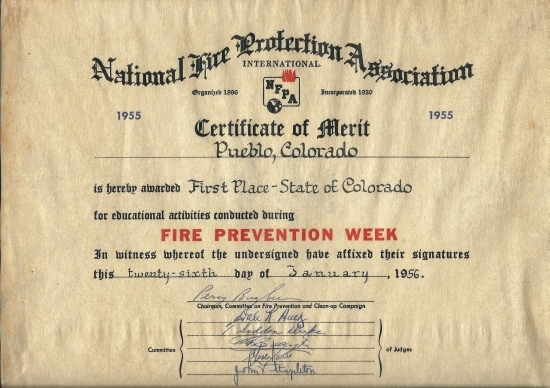 6 (the company can be seen in the "Early Pueblo Volunteer Fire Depts." link.) This photo is from the early 1880's. Thanks to Reed Morrow for sending this picture to us. The hat badge of Thomas Mulholland, Pueblo fireman from 1922 until 1942. We received this badge in March of 2012, and will proudly be added to our collection. The badge was donated by Pueblo Firefighter Kelly Firestone, who received the badge after the recent passing of Mulholland's daughter, Florence Snider. Thomas Mulholland - (left) from about 1923, this photo is featured on our museum t-shirts. (right) Mulholland in front of old Fire Station 5, at 24th Street and 6th Avenue. This photo dates from the mid 1930's. We have been getting a large assortment of old kids books for the museum, as well as cataloging all of the fire books collected throughout the years. We currently have over 200 books in our library, including a first edition IFSTA Essentials book still in the plastic wrap, most donated by past firefighters. A Prestone Anti-Freeze advertisement from 1947 featuring the fire service. Three volumes of the "Cyclopedia of Fire Prevention and Insurance", published in 1912 by the American Technical Society. 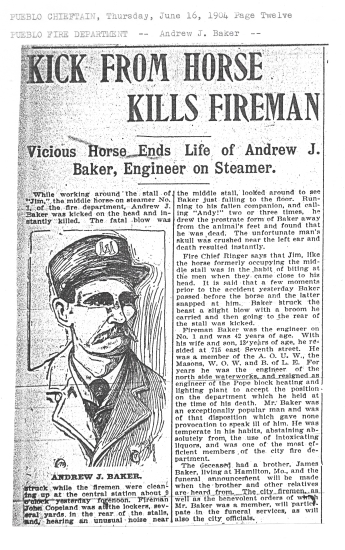 Fascinating books on everything related to the fire service in 1912. A book about the San Francisco earthquake and fire, and the Mt. Vesuvius eruption. The book was published in 1906 and has some amazing photographs and stories. A piece of the original wooden water pipes used in Pueblo. This is 36" in diameter and was dug up on Prairie Avenue. The section was presented to the fire museum by John Norton and the Board of Water Works, who built the stand and varnished the pipe. We thank them for their generosity and their work. Three of the four original EMERGENCY t.v. show comic books from 1971. 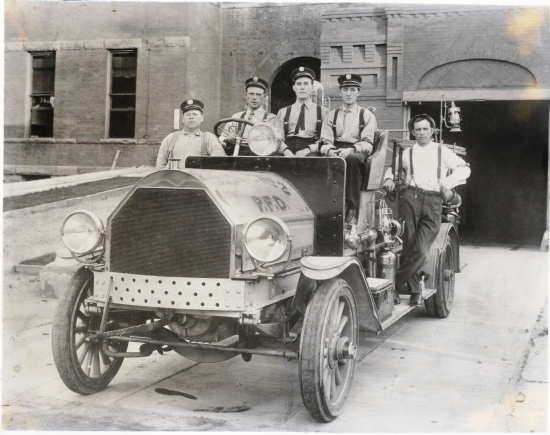 The original Pueblo Fire Dept. t-shirts from the 1980's. Two brass sprinkler shut-off tools. The bottom one mounted on a wooden handle and is spring loaded, while with the top shut-off, you would slide that ring on the left back to keep pressure once the tool was in place. (left) Two American LaFrance "Patrol Fire" extinguishers from the 1920's or 1930's, and (right) an article in the "Methods, Materials and Appliance" magazine from February 1921. This featured the "Christy Pumper" named after the builder, Pueblo's Fire Chief Sam Christy. This pumper was quite successful and cheap to build. The Christie Pumper was so successful that DeLaval Pumps featured them in this advertisement from May 13, 1925. The ad was featured in "Fire & Water Engineering" magazine. Chief Christy retired in 1931.